Contrary to popular belief, concrete and cement are not the same thing; cement is actually just a component of concrete. Concrete is made up of three basic components: water, aggregate (rock, sand, or gravel) and Portland cement. Cement, usually in powder form, acts as a binding agent when mixed with water and aggregates. This combination, or concrete mix, will be poured and harden into the durable material with which we are all familiar. Following is a group of articles that will be helpful when trying to understand more about concrete and cement. Other items that might be of interest to you include concrete basics such as mix design, and cement information. Concrete slab calculator - calculate how many yards of concrete and pre-mix concrete bags are needed for a job. Concrete driveway information, construction tips and design options. Stamped concrete - photos, patterns and tips for imprinting patterns in freshly placed concrete. Concrete prices - considerations about the cost of concrete. What is concrete made of? Portland cement, aggregate, sand, etc. Portland Cement - The cement and water form a paste that coats the aggregate and sand in the mix. The paste hardens and binds the aggregates and sand together. Aggregates- Sand is the fine aggregate. Gravel or crushed stone is the coarse aggregate in most mixes. 1. The concrete mix is workable. It can be placed and consolidated properly by yourself or your workmen. 2. Desired qualities of the hardened concrete are met: for example, resistance to freezing and thawing and deicing chemicals, watertightness (low permeability) , wear resistance, and strength. Know what you are trying to achieve with the concrete. 3. Economy. Since the quality depends mainly on the water to cement ratio, the water requirement should be minimized to reduce the cement requirement (and thus reduce the cost). use the largest size aggregate practical for the job. Use the optimum ratio of fine to coarse aggregate. Discuss how to achieve your goals for the concrete with your ready mix supplier. Admixtures are additions to the mix used to achieve certain goals. Here are the main admixtures and what they aim to achieve. Accelerating admixture-accelerators are added to concrete to reduce setting time of the concrete and to accelerate early strength. The amount of reduction in setting time varies depending on the amount of accelerator used (see your ready mix supplier and describe your application). Calcium chloride is a low cost accelerator, but specifications often call for a nonchloride accelerator to prevent corrosion of reinforcing steel. Retarding admixtures-Are often used in hot weather conditions to delay setting time. They are also used to delay set of more difficult jobs or for special finishing operations like exposing aggregate. Many retarders also act as a water reducer. Fly Ash- Is a by product of coal burning plants. Fly ash can replace 15%-30% of the cement in the mix. Cement and fly ash together in the same mix make up the total cementious material. Air Entraining Admixtures- must be used whenever concrete is exposed to freezing and thawing, and to deicing salts. Air entraining agents entrains microscopic air bubbles in the concrete: when the hardened concrete freezes, the frozen water inside the concrete expands into these air bubbles instead of damaging the concrete. Water reducing admixtures-reduces the amount of water needed in the concrete mix. The water cement ratio will be lower and the strength will be greater. Most low range water reducers reduce the water needed in the mix by 5%-10%. High range water reducers reduce the mix water needed by 12% to 30% but are very expensive and rarely used in residential work. Fibers can be added to the concrete mix in lieu of welded wire mesh. The problem with welded wire mesh is that it often ends up on the ground from being stepped on as the concrete is being placed. (particularly if no support blocks are used). Another problem is that mesh does not prevent or minimize cracking-it simply holds cracks that have already occurred together. If you could look into a section of concrete poured with fibers you would see millions of fibers distributed in all directions throughout the concrete mix. As micro cracks begin to appear due to shrinkage as water evaporates form the concrete (plastic shrinkage), the cracks intersect with the fibers which block their growth and provide higher tensile strength capacity at this crucial time. Click here for how fibers are an important part of "how to build high quality slabs on grade." When the concrete sticks to the trowel when it is lifted off the concrete, or concrete sticks to the finishers kneeboards, too much sand in the mix or higher than necessary air entrainment are most likely the causes. Excessive bleedwater will delay the finishing operation and can cause serious problems with the surface of the concrete. Adding more sand to the mix, adding more entrained air, using less mix water, or adding cement or fly ash are possible cures. Make sure your ready mix supplier knows if you will be pumping concrete. Pumping mixes require a sufficient amount of fines and there are limits to the size of the aggregate in order for the mix to be pumpable. Fly ash and air entrainment improve workability and pumpability. Setting time of the mix can be slowed with retarders. The mix may be cooled in hot weather by replacing part of the mixing water with ice, sprinkling water on the aggregate pile at the ready mix plant, or injecting liquid nitrogen into the batch. Setting time of the mix can be sped up with accelerators. The mix can be heated at the ready mix plant by heating the mix water and aggregates. Normal concrete weighs approximately 150 pounds per cubic foot and should be placed as near as possible to its final position. Excess handling can cause segregation of the course and fine aggregates. Wetting up the concrete so it can be raked or pushed into a location far from where it is discharged is not acceptable. 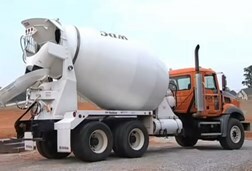 Concrete is poured directly from the chute of the ready mix truck, wheeled into place with a buggy, or pumped into place with a concrete boom pump (see concrete pumping). Concrete is normally specified at a 4-5" slump. Industrial, commercial, and some residential projects require an inspector on concrete pours who monitors the concrete slump and takes slump measurements at the required intervals. Short handled, square ended shovels are recommended for spreading concrete. A come-along (a tool that looks like a hoe and has a long straight edged blade) can also be used. Do not use a round edge shovel for spreading concrete since it does not spread the concrete evenly. Any spreader used should be rigid enough to push and pull wet concrete without bending: Normal concrete weighs approximately 150 pounds per cubic foot.